First of all BACKUP EVERYTHING!!! I use Titanium Backup Pro (and buy the pro key), and backup everything to an miniSD card, that way the apps and userdata can be restored in the new android rom (even if it’s a diffirent rom). Grap the latest version of Tubuntu from the thread “[Win32/64][Dual Boot][Mount-Loop] Tubuntu – 1 click installer SBK1 & SBK2! *2/1/2013*” on XDA forums. Locate the “Prime ROM” on the same page and download it (rename it “system.img”). Find and download the Linux image you want (on the same page I choose “Lubuntu v1.2 (12.10)”). Rename it “ubuntu.img”. Download the linux kernel you wan to run, I’ve had success with “2.6.36 – [cpu 1.4 ghz] [gpu 300mhz]“. Rename it “linux.img”. (I don’t get wifi if I use the kernel that comes in the tubuntu package, therefore this is needed for me). Start Tubuntu Put the tablet into APX mode (hold “vol up” + “power”), the red text in the upper right hand corner turns green. Remember to select the correct SBK!. When it’s done flashing, let it boot into the Android prime rom and finish the setup (it’s important to go through all the setup and reboot to android a couple of times, even if you’re going to install another rom in a minute). When that’s done you can boot into Ubuntu (press “vol down” + “power”, then “vol up” when it askes you to), and set up Linux. Reboot to linux a couple of times and make sure everything is working (it should be!). Now we’re ready to deploy the Android ROM of choice. I choose the TeamEOS3 Jellybean ROM. Download the ROM and Gapps and put them on a miniSD card. 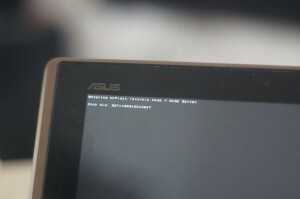 Connect the tablet to the computer again, fire up Tubuntu (select the correct SBK), put the tablet into APX mode. Go to the Advanced tab in Tubuntu and click to top flash button. 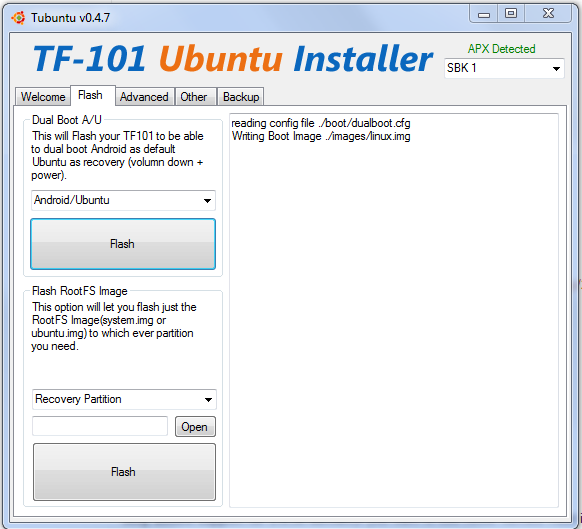 This will flash a recovery image that can be used to change the android rom. When it’s done flashing but the tablet into recovery mode (“vol down” + “power”, then when it asks, “vol up”). Do a “Factory reset”, then install the TeamEOS3 ROM. Restart the tablet and run through the setup process in Android. Restart to Android a couple of times more to make sure everything is working, then go back to the recovery mode and install the Gapps. Start android once again and make sure everything is working correctly (including Gmail, Maps and so on, you may have to find them in the store though). This entry was posted in Android, Linux, Tablets and tagged Android, Asus, Eee Pad Transformer, Jellybean, Linux, TF101, Transformer, Tubuntu, Ubuntu. Bookmark the permalink. I tried it several times now, but still i do not have any internet connection. Even with the kernel you suggested. Any ideas? Hmm, is this happening in Android or in the Linux distro you flashed? It worked for me, but with some of the Linux ROMs I tried WiFi didn’t work, so you could try to see if you can find another ROM to try out. BTW, you have to set up the WiFi connection in Linux, it doesnt get the connection settings from Android. Have you checked that? 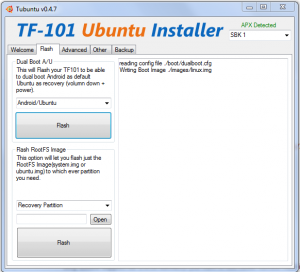 Using this guide: [GUIDE][Dual Boot][TheEasyway] How to setup Linux RootBind Method [Updated May 16th] I just installed [Linux] [IMG] [Dev] [WIP] *Ubuntu images for Rootbind [TF101 / TF101G] (Lubuntu 14.04 with Tegra drivers by DJDILL).